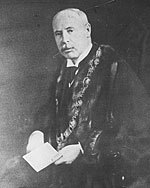 Henry Archer Ekers was born September 18, 1855 in Montréal. Industrialist, he was mayor of Montréal from 1906 to 1908. He died the first of February 1927 in Montréal. He studied at the Collegiate School. At 14, he started working in his father’s company, the Ekers Brewery on Saint-Laurent Boulevard, and one of the most important breweries of Québec at that time. In 1861, he succeeded his father, and the company prospered for more than 30 years. During his career, Ekers established the Canadian Breweries Ltd. and became vice-president of the National Breweries Ltd., regrouping in consortium about fifteen breweries. Alderman of Saint-Laurent ward from 1898 to 1906, Ekers was an influential member of the finance committee. He became mayor in 1906. Political parties abounded in Montréal. The claims of workers were increasingly numerous and radical, and took a clearly socialist tone. Demonstrations by the Socialist Party, preaching for the overthrow of the established social order, drew sparks from the bourgeoisie and clergy. Ekers prohibited their procession of 1907 and repressed demonstrators. On the municipal scene, many worried about the Working Party since it gained more and more voice without the assistance of traditional parties. From the bourgeoisie point of view, Labor and Socialist parties were condemnable. For others, it would be possible to deal with less radical elements. In the middle of all this agitation, Ekers, reformist in the line of Hormidas Laporte, was not in good position. The leaders of the reformist group, Laporte and Herbert Brown Ames, activated themselves on other political grounds. Ekers was thus deprived of the allies he desperately needed.